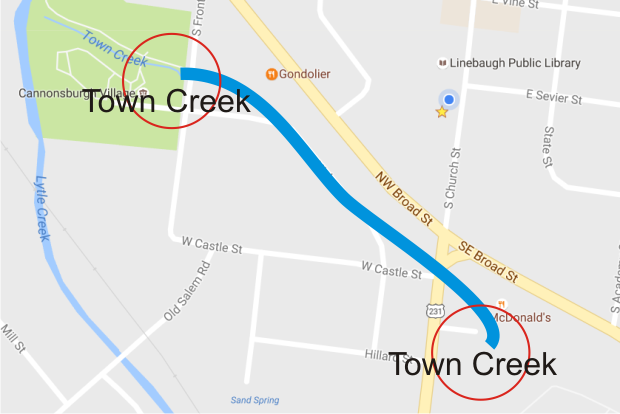 Town Creek in Murfreesboro is currently underground. It travels via a concrete pipe (culvert) between the Discovery Center and Lytle Creek behind Cannonsburgh. However, that creek will soon see daylight and a new walkway. The creek was originally placed underground by way of culverts in the late 1940's to construct U.S. 41 or Broad Street. The city has not yet announced plans for how they will allow for the pedestrians to pass under or over South Church Street and walk this greenway that would connect Murfree Springs Wetland to Cannonsburgh. Reports indicate it could be a concrete culvert under the roadway as opposed to a full bridge or simply a pedestrian crossing on South Church Street with no bridge or tunnel at all.